Yes, I should have read the book first and then seen the movie, but when Starship Troopers was released in the cinema I was only eleven years old. And at the time my reading list wasn’t quite as extensive as it is now. But I have finally managed to get to this one and let’s just say it wasn’t what I was expecting after having watched the over the top action movie more times than any person really should over the last fifteen years. The names are the same. That is pretty much the extent of the crossover … Thankfully I will add. I will say this to begin. I fully understand why this book is so highly rated. The ideas, especially when put into context of when the book was written, are thoroughly thought provoking. The battle scenes are presented like a scene from a blockbuster movie and really put you in the driver’s seat for the action. The philosophical questions posed in this future earth have not dulled with age. Reading this I constantly found myself stopping to think that the arguments Robert A. Heinlein is presenting are very convincing. His characters talk of our time with disdain and even mock our system of government. And although the world they are living in seems so utterly ridiculous, you end up nodding along as they discuss why the way we do everything is wrong. There were a couple of times when I actually thought I was sitting in a classroom myself hearing a lecture/debate on morality, civil service and the best way to govern a country. Those bits of the book were the highlight for me; the discussions and thoughts conveyed regarding personal sacrifice for the greater good. And when that is wrapped up in an action packed military fiction, you just can’t complain. The description of boot camp and life in the mobile infantry is so gritty and thus, to its core so real. I have never served in the military but I imagine that anybody who has could relate to this book. The story follows Rico as he joins the mobile infantry and travels the stars to battle the Bugs. In many ways this book didn’t need to be science fiction. The Bugs could have been replaced with foreigners from another country, and the spaceships with planes. But it wouldn’t have been the same. 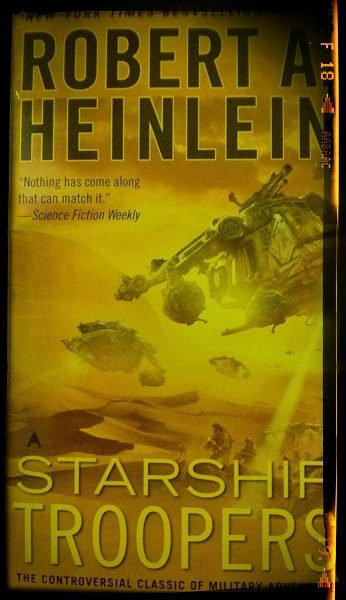 Heinlein’s words are a pleasure to read and have you drifting through pages with ease. Some classic works of SF can be a tad dry. This was vibrant, full of slang which helped to make it feel like our society and, most of all, believable. If I had to point at something I did not like I would say that I wasn’t the biggest fan of the way it ended. However, I cannot in any way suggest a better ending, so I will say he ended it well. I feel that this book could easily be one that students should study in high school. I know that many of the books that I read in my schooling did nothing to get me thinking differently. Yet, this book achieved just that, and all the while had marines splattering aliens across distant planets. What more could you ask for? This entry was posted in Reviews and tagged books, Mobile Infantry, Reviews, Robert Heinlein, science fiction, Starship Troopers by blottingaway. Bookmark the permalink.